Anyone who tries to understand Middle Eastern politics based on the contents of an Adam Sandler comedy deserves all they get. Despite his good intentions he bites off more than he can possibly chew in this, his new comic opus. 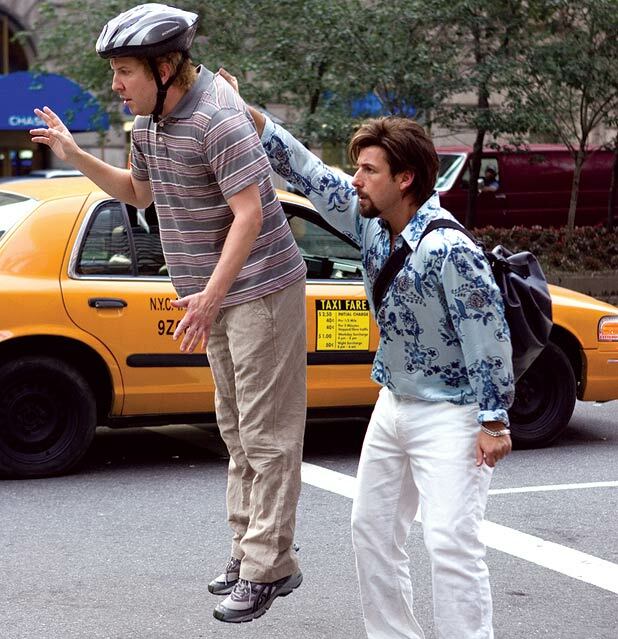 For you see You Don’t Mess With The Zohan is a tragic attempt to use outrageous comedy to smooth relationships between New York’s Israeli and Palestinian communities. This new potential cash cow for Sandler’s Happy Madison production company and director Dennis I Now Pronounce You Chuck and Larry Dugan has reportedly been in development since before the Twin Towers attack, but any notions that its delay is due to questions of taste are immediately removed by the introduction of Zohan (Sandler) an superhuman Mossad agent who renounces violence to pursue his real dream; a new life as a NY hairdresser. As well a Borat-style delight in his own nakedness, Zohan is characterised by his ‘funny foreigner’ enthusiasm for hummus, Euro-disco (Ace of Base’s ‘Beautiful Life’ features prominently) and Wham-era hairstyling. Most of all, he loves the older women who frequent his salon and whom he artlessly pleasures in his backroom, until romance with one encourages the hairdresser to face his past and put down some roots. Attempts to ring humour from topical subjects like home-made bomb-making sit uneasily with Sandler’s obvious ambitions to political gravitas, with the gags drying up in favour of an climactic mix of sentiment and action. Sandler has tried to refine his angry-guy persona in Punch Drunk Love and Reign On Me, but Zohan’s call for understanding lacks conviction or bite. General release from Fri 15 Aug.